The Victorian’s certainly knew a good walk and the bridleway to Bowscale Tarn provides an excellent example. I prefer extending their walk over the tops but even for those who just want a short walk by following the footsteps of the Victorians it is very worthwhile. Nowadays Bowscale Tarn has fallen out of favour but only because the whole area around the back of Skiddaw and Blencathra is rarely visited except for enthusiastic peak baggers. However this walk is not just about completing both peaks, it is about admiring the excellent cliffs of Bannerdale, enjoying the remote scenery and visiting one of the most perfectly formed tarns in the Lake District. Sadly Bowscale Tarn faces due north and rarely seems to get much sun(witness the poor souls in one of the pictures) but for anyone interested in the impact of glaciers on the geography of an area it is a great spot. Above the tarn and over the summit of Bowscale the walk skirts the cliffs of Bannerdale and I would recommend taking the track nearest the cliffs to enjoy it too its fullest. Only a fool would fall off although Bracken my old collie did have a rather disturbing habit of snow sliding uncontrollably on her back towards steep drops and only just scrambling clear before disappearing in to the void. Recommend: The best descent by far off Bannerdale Crags is down the ENE shoulder only 100 yards from the summit. It is steep but without difficulties and as well as being dramatic leads through what appears to be a mini slate mine. Start Point: NY 362302. 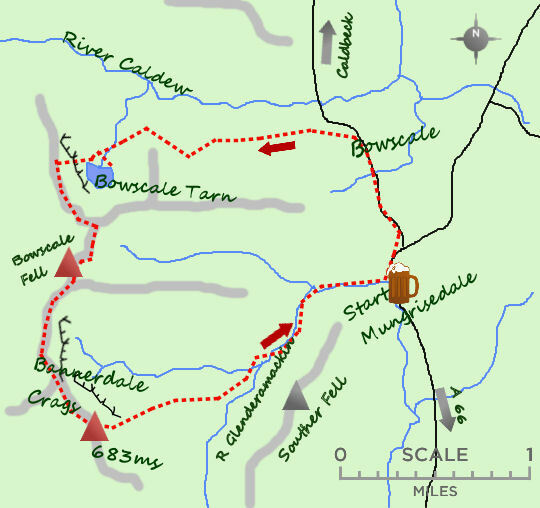 Mungrisedale is the best place to start and finish this walk. Not only is the road walk done early but the Mill Inn can be visited for a tea before and a pint after! Terrain: Road followed by bridleway and an intermittent track over the summits is ended by rather a boggy path out once you are off the Bannerdale Crags ENE ridge. Eating & Drinking: The Mill Inn at Mungrisedale is perfect. Friendly service is complemented by a quirky inside (not yet opened out as appears to be the fashion) it also has long opening hours during the day. The start is on the road in Mungrisedale, the Mill In . Post Code CA11 0XR. The walk is easy up to the tarn, then a steep climb and then a wide ridge. In good conditions the walk is moderate but in cloudy, bad weather you do need to be able to map read properly. Can anyone please tell me the best place to park to start this walk and is it moderate? Could you please also supply the postcode to get there. Thanks. Did this walk with mt daughter yesterday as we needed a lakeland fix but as the weathervwas glorioys knew most routes would be crowded. This walk was perfect. The tarn is beautiful and the scenery was lovely. We only saw 6 other walkers all day until the last mile next to the river. Thank you for the walk suggestion. Will possible do this next week. How long does this walk take?